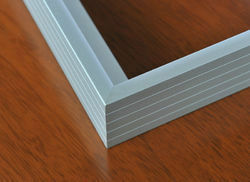 we leading manufacturer of aluminium solar frame profile as per buyer need alloys and specification. - Trustwell Industries develops, constructs and operates utility-scale Renewable Energy Systems across various locations in India. We also facilitate financing through various financial institutions . - This panel comes with a robust ABS plastic frame. Panel can be used outdoors. - This comes with mono - crystalline solar cells, which are much more efficient and longer lasting than poly crystalline solar cells. - 175.0mm. It comes with a 3 meter cable with a DC socket. Our products are quality checked on well-defined parameters, to deliver defect free range at clients' end. Our company holds vast experience in this domain and is involved in offering Solar Mounting Frame.